Iranian President Mahmoud Ahmadinejad on Monday ruled out nuclear negotiations with other nations, saying, "Iran’s nuclear issue is over, in our opinion." At a news conference in Tehran, the hardline president also said that if re-elected he again will call for a debate with President Obama. 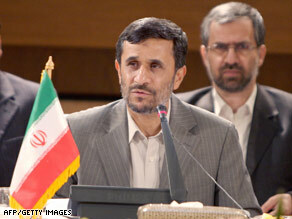 Ahmadinejad previously urged a debate with President Bush and offered to debate both Obama and Republican presidential candidate Sen. John McCain during last year’s U.S. presidential campaign. The Iranian presidential election is June 12. “I will extend that invitation one more time, so that there and then at the United Nations headquarters, President Obama sits there at the table and discusses world issues management and the way toward peace,” Ahmadinejad said, according to a live translation of his remarks. Like the Bush administration, the Obama White House suspects that Iran is working to build nuclear weapons under the guise of a nuclear energy program — an allegation Ahmadinejad denies. The five permanent members of the U.N. Security Council — the United States, Britain, France, Russia and China — joined by Germany, have tried to negotiate with Iran and bring an end to the nuclear standoff. But Ahmadinejad said Monday that Iran will operate “only within the framework of the International Atomic Energy Agency,” the U.N. nuclear watchdog. Any talks outside that agency will focus only on “management of world issues and establishment of peace and security, which is lasting for everyone in the world,” Ahmadinejad said. Speaking on a day that North Korea conducted a second nuclear bomb test in defiance of international warnings, Ahmadinejad was asked whether his country has cooperated with Pyonyang on nuclear efforts. “There is no cooperation between us,” he said. “We’re opposed to nuclear proliferation; we’re opposed to storing nukes. We have announced this repeatedly.” He added that he believes “countries like America are not able to manage the political atmosphere” surrounding such issues.